Unlike his first two albums Frankie Miller’s third album “The Rock” featured his own backing band so was marketed as being by The Frankie Miller Band rather than as a solo release. Recorded in sight of the famous Alcatraz prison during the first half of 1975 it still contains certain elements of those first two albums “Once In A Blue Moon” and “Highlife”. 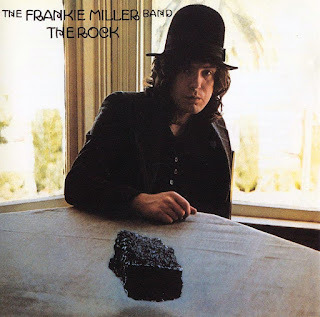 It is testament to Miller’s skill as a songwriter and vocalist that the basic pub rock of that opening album, the laid back New Orleans soul of “Highlife” and the country tinged rock and blues of The Frankie Miller Band all blend together so seamlessly on “The Rock”. The band itself featured Henry McCullough on guitar, Chrissy Stewart on bass, Mick Weaver on the keyboards and Stu Perry on the drums. All of whom already had illustrious CV’s to their name. The “Highlife” style soul feel was provided by no less a talent than The Memphis Horns and the Edwin Hawkins Singers of ‘Oh Happy Day’ fame. Add to that a backing vocal appearance by James Dewar vocalist with Robin Trower and it is no wonder “The Rock” is such a solid and consistent effort. The production duties were handled by Elliot Mazer who had been involved in the recording of Neil Young’s “Harvest” a few years previously. As he had been with the previous years album “Highlife” Miller was critical of the final mix and production sound, feeling that it lacked the real live feel that he desired. A couple of years earlier Miller and former Free bassist and songwriter Andy Fraser had attempted to put a band together but despite spending several months in the studio they never managed to get anything solid going. What they did achieve though was to form a lifelong friendship and a great song writing partnership. ‘A Fool In Love’ was one of the tracks that came from those sessions and that gets “The Rock” off to an explosive start. Miller’s vocal kicks in virtually as the track begins and the gritty delivery is reminiscent of the first album whilst the horns and backing vocals are more akin to something from the second album. The influence of Fraser gives the song a real feeling of being a band song rather than that of a solo performer and also adds a commercial flavour showing that he was never the junior partner in the main song writing team with Paul Rodgers in Free. It provided Miller with his first considerable success in America and was later covered by Delbert McClinton, Etta James and UK rockers UFO to name but three. Second track ‘The Heartbreak’ is a slower struttier track with a good mix of rock, blues and soul feeling in both the vocal and the musical backing. The piano underneath the vocal drives the song along nicely and a decent guitar and organ solo along with some typically classy horn work all blend together to make it a real stand out track. It is almost a precursor to Miller’s rockier albums of the eighties. The title track is next up and gets the toe tapping straight away with its country rock flavoured tinge. A twangy guitar, some bar room boogie woogie piano and gospel backing vocals all compliment Miller’s easy vocal and it really should have provided him with his first major hit. The song itself was inspired by the sight of Alcatraz from the recording studio and Miller’s belief that were it not for music he would probably have ended up in somewhere similar. Subsequently the album was dedicated “ …to the plight of prisoners ….”. The Frankie Miller Band actually played a gig in promotion of the album at San Quentin jail where Johnny Cash recorded his famous live album. The second of the tracks resurrected from the Rumbledown Band sessions with Andy Fraser ‘I Know Why The Sun Don’t Shine’ slows things down considerably. A gradually building brooding blues it is a little slower and more of a stripped back basic blues than the original Rumbledown Band recording which featured Paul Kossoff on guitar and eventually surfaced on the Paul Kossoff compilation album “Blue Soul” in the mid eighties. Although Henry McCullough is a fine guitarist and puts in a typically classy performance it is difficult not to prefer the faster and more soulful Rumbledown Band version with Kossoff. The first half of the album ends with ‘Hard On The Levee’ which despite being one of the lesser cuts on the album is still a mighty fine piece of work. It was an integral part of the live set and gives a clear indication of the direction Miller would go in with his next album “Full House”. One of Miller’s most loved, and most covered, songs ‘Ain’t Got No Money’ gets the second half of the album off to the same high standard as the first. A live favourite it is classic Miller and has claims to be the best bar room stomp track of all time. The song has a no frills fast paced approach with some more great boogie woogie piano, frenetic drumming, another tasteful solo and even a bit of cowbell unless I am very much mistaken. Throw on top of that a dirty gritty Miller vocal and you have something which is impossible to fault. The track has been covered by such diverse acts as Chris Farlowe, Bob Seger and Cher. Having never heard the Cher version I can’t comment on it but I would assume there were a few lyrical changes. The Seger version is pretty true to the original albeit with more of an American country feel. Segar is often compared to Miller stateside and openly cites Miller as a huge influence. ‘All My Love To You’ displays Miller’s more soulful side and is very Otis Redding/Arthur Conley like vocally. A Miller composition it has the feel of an old time soul track and it is not difficult to imagine it being belted out by those soul greats Miller admired so much. The Memphis Horns give the whole thing a great authenticity and Miller’s vocal is as good as any of those he admired. Things quicken up again for ‘I’m Old Enough’ which features a typically well thought out Miller lyric over a bouncy fast paced rock beat. Some simple but effective guitar and more classy ivory tinkling add to the track nicely and the whole thing has a great sing-along feel. As with the earlier faster tracks Miller’s vocal is full of grit and attitude. An edited version was released as a single but failed to trouble the judges although that didn’t stop the French Elvis, Johnny Halladay, trying with his own version. The final two tracks of the album take us back to Miller’s roots in Scotland. ‘Bridgeton’ is named after the area of Glasgow he came from and is another slower brooding track which builds nicely and tells the tale of Miller’s days there. The guitar has a dobro or even steel feel in places and there is even something which sounds uncannily like bagpipes although there is no suggestion of either in the sleeve notes so I am guessing it must be an organ effect. Whether that is the case or not the more obvious organ work is one of the highlights., as is the very sing able vocal melody. The title of the final track ‘Drunken Nights in The City’ is pretty explanatory and tells the tale of Miller’s nights of heavy drinking with Celtic footballer Jimmy Johnstone. Miller is an avid Celtic fan and often wore a Celtic shirt on stage. The track itself is a simple vocal over an acoustic guitar. On live performances Miller would often play the song alone and the guitar playing here sounds like it is Miller rather than McCullough. The vocal also has a feel of being recorded after a decent amount of alcohol had been consumed. This gives it a very authentic feel and is either a great display of vocal acting by Miller or totally authentic. Having seen a few live shows my money would be on the latter ! Despite being released to critical acclaim ‘The Rock’ like its predecessors failed to shift a huge number of units but the American tour to promote the album was a huge success and they regularly went down better than the acts they opened for. A UK tour with Rory Gallagher was not as successful though as guitarist McCullough was pre-occupied with recording his solo album and eventually the band began to fall apart. A disconsolate Miller went off to Holland to sing with old mates Procul Harum. 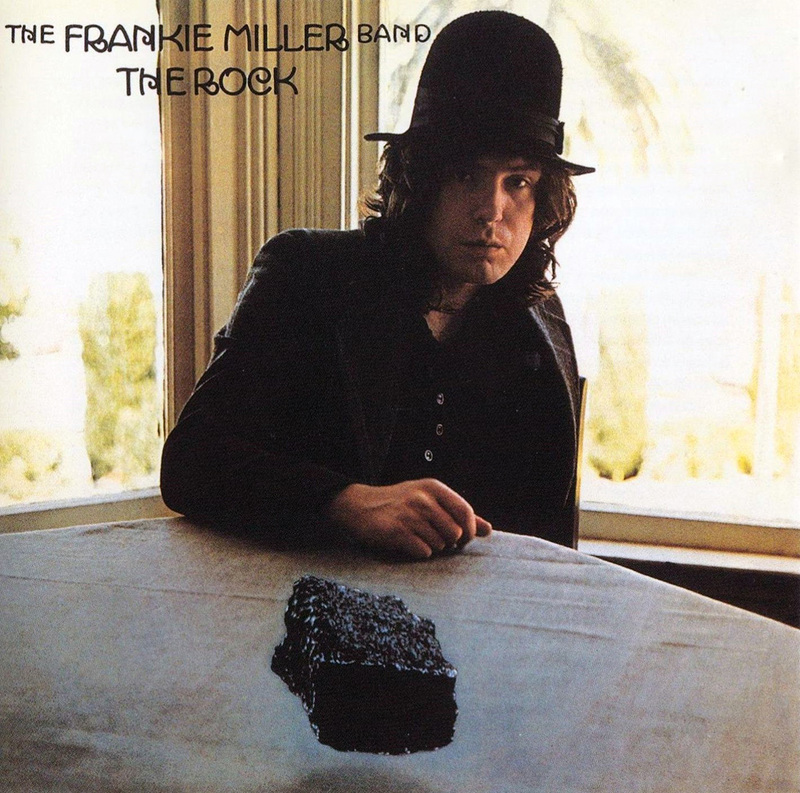 For me “The Rock” is the album where the final pieces of the Frankie Miller sound and style came together. The basic pub rock elements of the first album and the smooth laid back vibe of the Toussaint collaboration are both evident throughout but have now been married together with a bluesy soulful band feel and a smidgeon of American country commerciality. 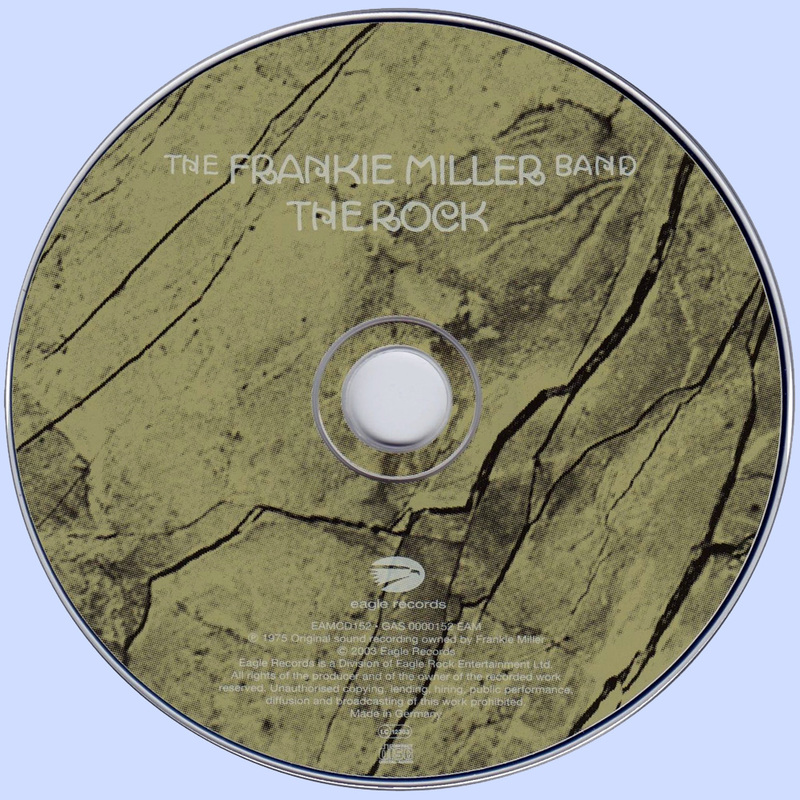 This was very much the blueprint for his next venture “Frankie Miller’s Full House”, a band which encompassed the sound and styles of his first three albums into one tight unit and finally delivered the chart success he deserved.